Man’s inhumanity towards man has been getting plenty of coverage lately – it might be time a good time to be reminded of men who demonstrate humanity. Not quite 10 percent of nurses are male (please don’t call us male nurses – we’re nurses, but happen to be male). Like our female colleagues, we’re spread across all aspects of health. Blokes nursing in Cairns include Stephen in Intensive Care; Adrian and Denis who work with elderly people; Bill the midwife; Andrew in orthopaedics; Colin who runs a medical ward; Sean who visits new parents and their babies in their homes; Greg and Clif who work with people battling mental health problems; Andy does mostly policy and administrative stuff; Steve and Scott on the local crisis team, and Nick who has spent a fair bit of time nursing out bush and is currently back in town. There’s plenty of blokes nursing locally not mentioned (sorry fellas), but you get the picture – we pop up everywhere. So, why nursing? I won’t presume to speak for other nurses of either gender, but I can tell you what I like about the profession – I like being useful. It’s a peculiar privilege being a nurse. Peculiar because, for all its different guises and specialities, the basic job description is the same – try to be useful to people. It’s a privilege because nursing offers an amazing level of responsibility and intimacy. It might sound more convincing if it wasn’t coming from a bald bloke with a bit of a beer gut, but nursing is a nurturing profession. The nature of our relationships with patients is therapeutic, but first and foremost it’s a human relationship. We often have the privilege of being with people at very important stages of their lives, and we get the opportunity to show that nurses can be professional, skilled and caring. I’m sure it’s not unique to nursing, and it’s certainly not unique to nurses who are male, but let’s not forget that there are daily demonstrations of man’s humanity towards man. Back in 2003 a journalist from The Cairns Post invited me to submit an article for the My Say column (a daily feature presenting the views of a cross-section of the community). The article’s reference to man’s inhumanity to man is in the context of current events at the time – it was published during the second week of the war in Iraq. In 2003 I should have used the phrase “man’s humanity towards mankind” instead of “man’s humanity towards man”. Sorry. I was tempted to correct it in this 2014 version, but decided it was more authentic to leave the original unaltered. Anyway, I stumbled across the very-low-resolution JPG version of the article today and thought it might be worth reprising. Man’s inhumanity towards mankind is still dominating the mainstream media. This is a tiny, inadequate bit of counter-balance. McNamara, Paul (2003). Humanity to man. The Cairns Post, 29 Mar 2003, pg 19. This entry was posted in Blog and tagged emotional labour, men in nursing, nursing, nurturing, violence on 26 October 2014 by Paul McNamara. Umm. That wasn’t an excellent nursing course. That’s a crap nursing course. Look, us Aussies like to tease the Brits about their weather and cricket team every chance we get, but I’m not accustomed to criticising their nursing courses. The truth is, I do not know enough about nursing courses in the UK to hold any strong opinions about how good or bad they are. 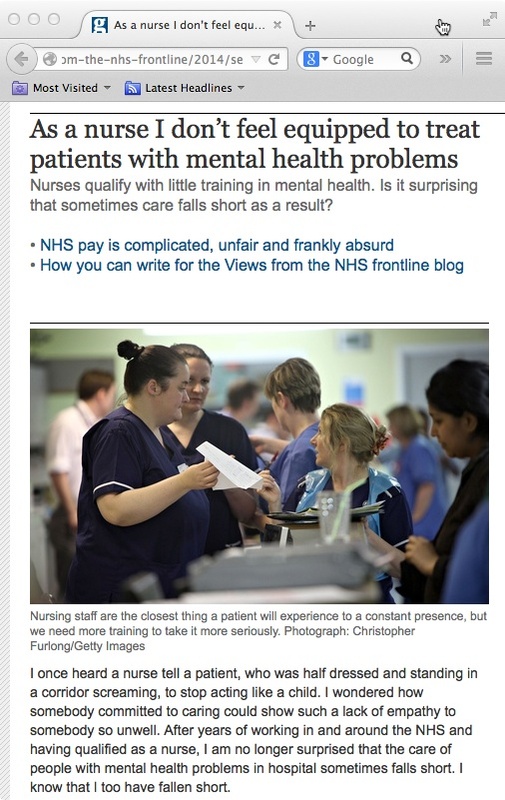 That said, I wonder what the general public would think of hospitals being staffed by nurses who had undertaken, as reported, a three year nursing course that includes only three days of teaching in mental health. I am glad that doesn’t happen in Australia. Since July 2000 most of my work has been about supporting mental health care in the general health settings as Consultation Liaison CNC (more about that here) and as Perinatal Mental Health CNC (more about that here). These roles have direct clinical input, but also have a lot to do with supporting general nurses and midwives to feel more confident and become more skilled at providing direct clinical care to people experiencing mental health difficulties. It’s inevitable that they’ll need these skills – a significant proportion of people who access general hospitals and/or maternity services also experience symptoms of depression, anxiety etc. Dumbing-down mental health education for general nurses and midwives is dumb. 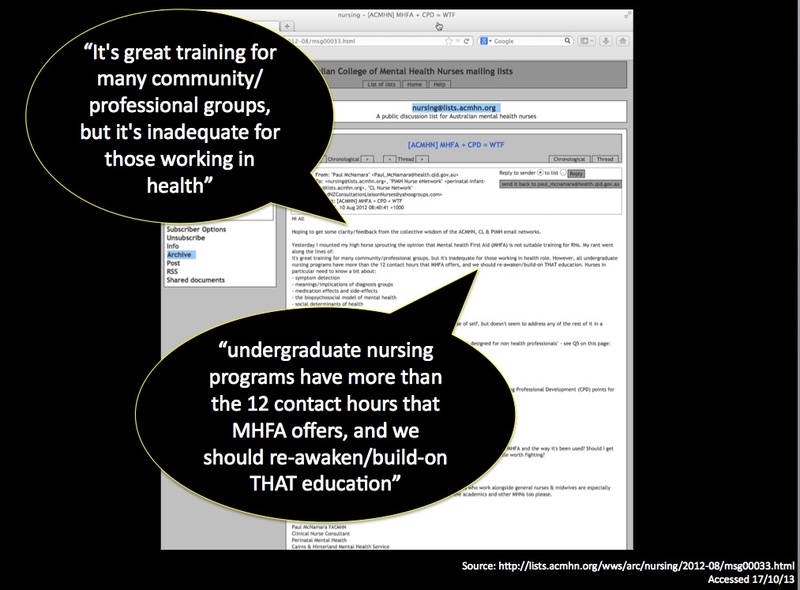 To give MHFA their due, they have never claimed their training to be an alternative to formal nursing education (others have). MHFA does a good job at informing first responders, but does not address mental health in a manner suitable for a frontline clinician. 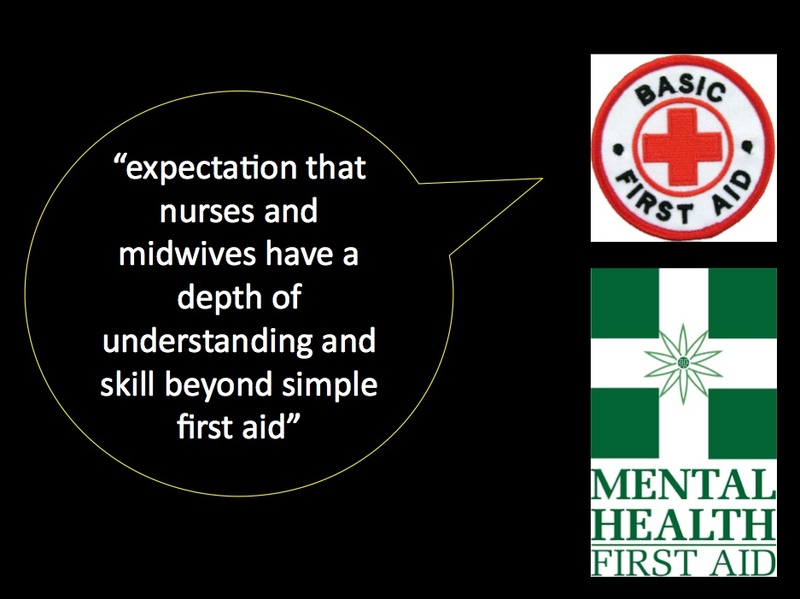 There is a community expectation that nurses and midwives will have a depth of understanding of mental health beyond that of the general community, beyond basic fist aid. Let’s make sure that we continue to defend the quality and depth of undergraduate nursing and midwifery training in Australia. We must never let it slip like the UK example of just three days training in three years. That is woefully inadequate. If you’re a nurse or midwife with strong opinions about a subject, it doesn’t hurt to discuss these opinions online. As per this example, a discussion held online morphed into a conference presentation and a journal article. 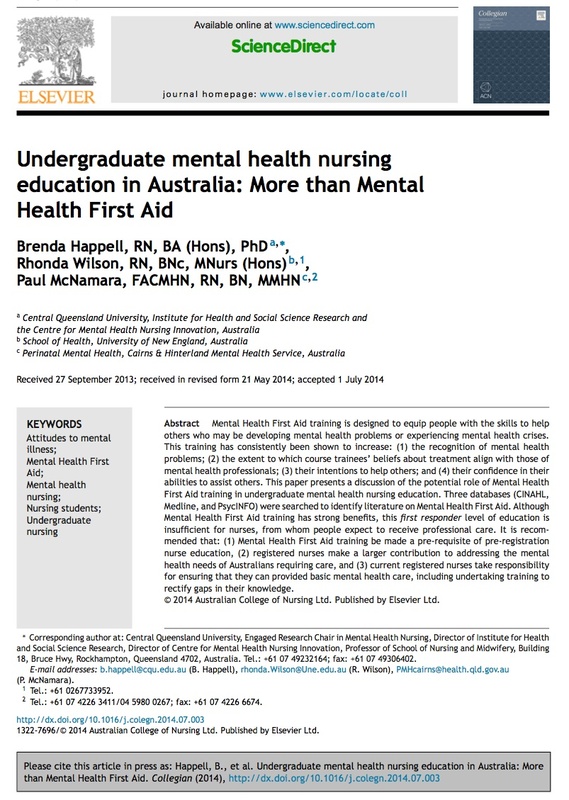 For me, anyway, the difference between it being a rant and a paper was the interest and input from a couple of Nursing Academics: Brenda Happell (@IHSSRDir on Twitter) and Rhonda Wilson (@RhondaWilsonMHN on Twitter). Thanks for reading this far. As always, your feedback is welcome in the comments section below. This entry was posted in Blog and tagged consultation liaison, education, FOANed, mental health, nursing, Perinatal Mental Health on 21 October 2014 by Paul McNamara. Every now and then somebody trots out a phrase like, “It’s a fine line between madness and sanity” (or words to that effect). It makes me cringe a little every time I hear it. This version of “It’s a Fine Line” paints an unrealistic and unkind picture. It creates an impression that anyone who is “sane” (whatever that is) could, in a random moment, cross a line and become “insane” (whatever that is). It also creates an impression that jumping back across the line should be just as quick, just as fateful. This version of “It’s a Fine Line” is a dopey dichotomy – it divides humans into two tribes. It creates an illusion that you can only be one thing or the other, but could not be a bit of both or somewhere in-between. Rubbish. It’s a passé cliché. It’s a myth. There is not a fine line to cross. There is a fine line that we all slide along – first one way, then the other. When it comes to mental health all of us travel somewhere along a fine line that connects the extremities of “very well” to “very unwell”. We all are on the same line; we are not all on the same section of the line at the same time. If we are lucky we will spend most of the time somewhere along the continuum between the middle and the “very well (thanks)” point at the end. 100% “sane” (whatever that is) is not achievable. If it is achievable, it’s not achievable 100% of the time. Even the Dalai Lama would have bad days. Nelson Mendela seemed better put together than most of us (in a healthy-mind-kind-of-way, that is). Was Nelson Mandela 100% sane 100% of the time? Nope. None of the heroes of humanity and none of us ordinary peeps are 100% sane 100% of the time. We are not statues on Easter Island. We are human. We all change. We are all affected by what we experience. We all have good days and bad days. When this combination happens people are prone to experiencing psychosis (ie: loss of contact with reality). I have not kept count of the people I’ve worked with who have experienced psychosis – certainly hundreds, probably thousands. However, I’ve never met someone who is 100% “insane” (whatever that is) 100% of the time. People who experience mental illness are on the same line as everyone else. On occasions they spend some time closer to the difficult “very unwell at the moment” end of the mental health continuum than they would like. They are not statues on Easter Island. They are human. They all change. They are all affected by what they experience. They all have good days and bad days. Of course, these things are true of us all. Don’t believe me? Try substituting “they” with “we” in the paragraph above. 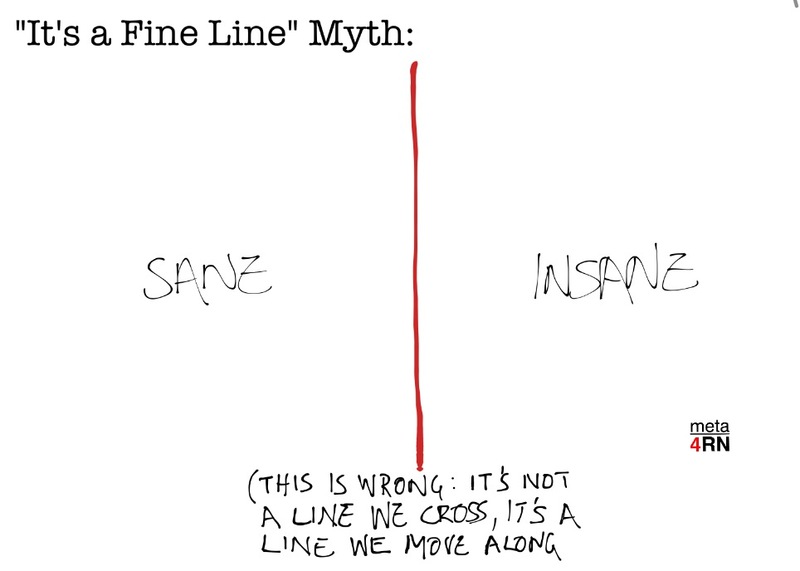 The “It’s a Fine Line” Myth divides us. 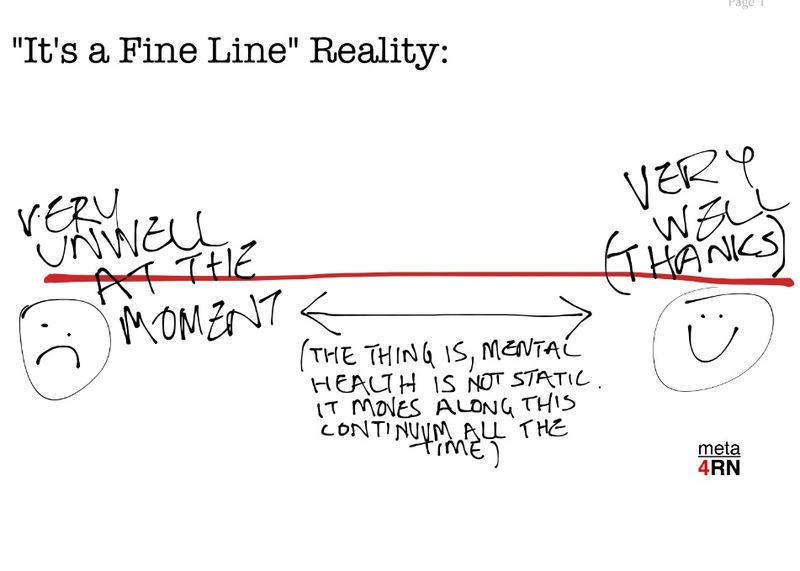 The “It’s a Fine Line” Reality is much different, much better. There is a fine line. It does not separate us, it connects us. We are all sliding along the same fine line. Thanks for reading this far. As always, your comments are welcome below. This entry was posted in Blog and tagged emotional intelligence, mental health, MentalAs on 1 October 2014 by Paul McNamara.